So now we know that the main party leaders in Britain would vote to stay in the EU if there was a second referendum – hence the growing attacks on the government from those in the Brexit camp, writes Denis MacShane. Denis MacShane is the UK’s former Minister of Europe. As UK Prime Minister, Theresa May, cancels her Monday appointments to rush to Brussels for an unscheduled dinner with Jean-Claude Juncker and Michel Barnier the era when Brexit was the nirvana-like future for Britain is drawing to an end. The economic news and the business world’s terror at crashing out of Europe is now so strong that politicians have to respond. There has been a dramatic shift in political leadership language since the June election. The main party leaders in Britain now make clear they would vote to stay in the EU if there was a second referendum. Theresa May refused three times to say on an LBC radio phone-in last week if she would now vote to Leave if a new referendum took place. It is a denial rather than a positive affirmation but given how hard it is to get a firm answer from Theresa May on anything it is safe to assume that is a Yes to Remain. And Jeremy Corbyn also said that he would vote Remain. Thus in the space of 4 months, the Conservative and Labour Party have moved from advocating Brexit and accepting that the referendum result of 23 June 2016 meant leaving the Single Market, the Customs Union, and imposing visas and work permit on European citizens to now saying that they are in favour of the EU. This explains the sudden ferocity of attacks by the more fanatical of the pro-Brexit camp on the Government position. They do not want directly to attack the Prime Minister. Boris Johnson already tried his hand at a putsch before the Conservative Party conference with a 4,000 word manifesto given front page prominence by the Daily Telegraph. This once respected paper has given up nearly all claim to objective factual reporting and balanced comment on Brexit as each day its stories and comment are purely propagandistic against the EU. John Peet, the experienced and respected Europe editor of theEconomist, noted in a tweet that Daily Telegraph editorials now resembled garrulous letters to the editor, written by angry anti-Europeans plugging away at their favourite prejudice. The Telegraph sought to displace Theresa May and promote Boris Johnson into 10 Downing Street. But the plot backfired. The sheer disloyalty, vanity and naked ambition of Johnson provoked many Tory MPs to denounce him. Papers like The Times called him a ‘liar’ or a “charlatan” – language never before used by even the most aggressive journalists against a British Foreign Secretary. Mrs May made her speech in Florence in which she called for a transition period after the end of March 2019 when the Article 50 negotiations end and Britain formally leaves membership of the EU Treaty. She talked about continuing present arrangements, said the UK accepted it had financial obligation, and wanted a new deal with the EU which would take some time to achieve. She sent up smoke screens by talking of being outside the Single Market and Customs Union – the lines that hard-line Brexit obsessives call for – but the message was one of retreat into a transition phrase in which Britain provisionally stays de facto in the EU for the time being. As Norway and to a lesser extent Switzerland have shown it is possible to be outside the EU but still keep many if not all the economic advantages of EU membership in terms of market access providing a non-member state abides by EU rules, accepts EU laws and norms and decisions by the European Court of Justice and makes an appropriate contribution. The French say that nothing lasts longer than the provisional and Mrs May was suitably vague as to whether a provisional transition period might last two or three years. From a party political point of view this makes sense. Brexit is sucking all the life juices out of the Tory Party. No Tory MP wants to risk a Jeremy Corbyn government by voting in a confidence vote in the Commons to bring down the government and hold an early election. Nor do most Tory MPs – other than 50-60 hardline pro-Brexiters – want to have the period from April 2019 to the next election dominated by Brexit. Like in the days of the German Green Party when the Greens divided into Realos (Realists) and Fundis (Fundamentalists) the Conservative Party has its realist wing headed by Theresa May and Chancellor Philip Hammond, and its fundamentalist anti-EU wing with the 3 Musketeers of Brexit – Boris Johnson, Liam Fox and David Davis – insisting on a full and fundamental amputation from Europe. The Tory Fundis returned to the charge once Parliament was back by calling Philip Hammond a “saboteur” – a charge that brings back memories of Stalin’s campaigns to crush saboteurs within the USSR who he said were wrecking the purity of the Bolshevik dream. 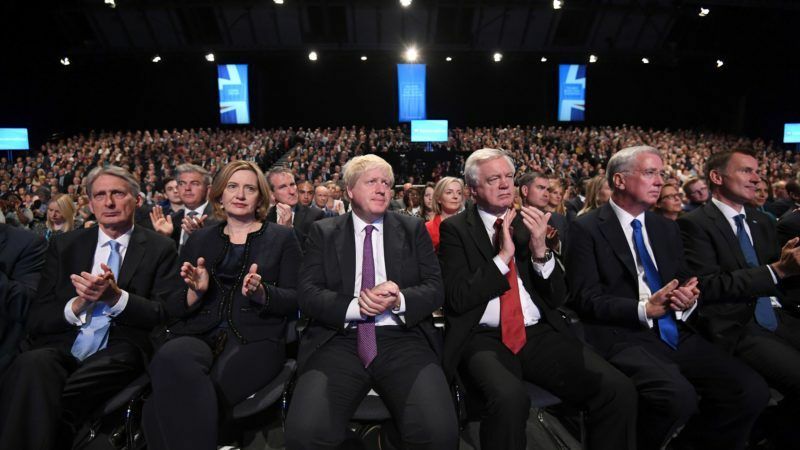 Most Tory MPs are keeping their heads down and saying as little as possible about the open warfare in the British Tory Politburo or Cabinet as it is officially called. Both Labour and Tory MPs are busy tabling hundreds of amendments to the EU Repeal Bill to the point that debate and votes on it have had to be postponed as Mrs May cannot be sure of winning her way given the minority status of Tory MPs after their losses in the June election. In my new book, Brexit, No Exit. Why (in the End) Britain Won’t Leave Europe (IB Tauris) I explain various scenarios from a new referendum (not a second one as there have been two so far on Europe in 1975 and 2016) but a completely new one or a suspension of the Article 50 negotiations to opting for a status like EFTA or European Economic Area (EEA) members which means that Britain does not cut herself off from Europe. Time is running out but it now seems clear that the Prime Minister, her chancellor, a majority in the cabinet and now the Leader of the Labour Party are beginning to see what a disaster Brexit would be for Britain. The question remains: Has this revelation come in time or is it too late? Mrs May arrived in Brussels hoping for some leeway before the 19thOctober EU Council. Too many UK businesses from airlines to banks to drug firms are saying that December this year is the cut off at which they simply have to re-locate out of the UK if they do not have certainty of single market access. She hopes to negotiate with Juncker and Barner. But the real negotiation is with her own MPs, with the off-shore owned press and with the British people.